Elizabeth Blackwell was the first woman in America to be awarded a medical degree. She pioneered the education of women in medicine, opening her own medical college for women. She was the first woman to be admitted to the British Medical Register, enabling her to practice medicine in the UK as well as in the USA. Elizabeth Blackwell was born on February 3, 1821 in Bristol, England, United Kingdom. Her father, Samuel Blackwell, was a prosperous sugar refiner in the city. Her mother, Hannah Lane, came from a family of prosperous merchants. Elizabeth was the third of nine children in a wealthy and deeply religious family, who worshipped in an independent Protestant church. She rarely attended school but, along with her four brothers and four sisters was educated at home by private tutors and a governess. Elizabeth loved reading and spent any money she got on books: her favorites were Mary Martha Sherwood’s children’s stories. Elizabeth’s father, Samuel, exerted a positive and caring attitude towards his children: he believed in developing their full potential. Unusually, he rejected punishing his children physically. Instead, their misdemeanors were written down and added up. Too much wrongdoing would result in a child being banished to the attic rooms during dinner. Elizabeth enjoyed her childhood and was very happy. In 1831, when Elizabeth was 10, there was political upheaval and uncertainty in Bristol. At that time only 6,000 of the 104,000 city population had the vote. Rioting broke out when parliament’s upper house rejected reform of the voting system. Following the loss of his sugar refinery in a fire, Samuel decided to take his family to live in America. In August 1832, the family embarked on the liner Cosmo for a seven week voyage to New York, where Samuel established the Congress Sugar Refinery and for six years the family lived in the cities of New York and Jersey. The sugarcane industry used slave labor. Samuel was active in the abolitionist movement and the family attended anti-slavery fairs and meetings. In fact, Samuel’s children found slavery so abhorrent that they refused to eat sugar. Samuel’s refinery fell into financial difficulties in the depression of 1837, so he sold it and moved to the expanding town of Cincinnati, Ohio to grow sugar beet – he intended competing with the slave-intensive sugarcane industry. Sadly, it was not to be. Just a few weeks after arriving in Cincinnati, in August 1838, Samuel died of fever. He left his family nearly insolvent. With the family’s survival at stake, Elizabeth, age 17, and her older sisters Anna and Marian started a school in their home – The Cincinnati English & French Academy for Young Ladies. The school made enough money to keep the family going until the youngest children reached maturity. The sisters closed the school in 1842, and Elizabeth continued teaching students privately. At the age of 21, although romantically attracted to and attractive to men, she resolved to become self-sufficient. She preferred not to rely on a husband for her income and security. Returning to Cincinnati, a friend, close to death, told her that her illness would have been more bearable if she had been treated by a woman, because she believed women had compassionate natures. Blackwell thought about this, coming to the conclusion that many women would be more comfortable being examined and confiding their medical ailments to a female doctor. She had always been physically repelled by diseases and ailments of the body, but she decided the right thing to do was overcome her emotions for the greater good. Medical school expenses would be around $3,000. In order to raise the money, between 1845 and 1847 Blackwell taught school in slave states again – North and South Carolina. She tried to offer school classes to slave children in North Carolina, but discovered it was illegal to do this. However, she discovered it was legal to teach slave children at Sunday Schools, so this is what she did. In Asheville, N.C., she lodged with the Reverend John Dickson who had been a physician. Dickson allowed her to study his medical books. In Charleston, S.C., she lodged with Dickson’s brother Samuel. Samuel was a professor of medicine, who encouraged her, tutored her, and allowed her to borrow his books and continue her intensive efforts to become a physician. Blackwell applied to several medical schools without success. She moved to Philadelphia in 1847, aiming to study at one of its medical schools. She boarded with a liberal Quaker physician and took private anatomy lessons. Unfortunately, she was rejected out of hand by all the medical schools she applied to. Blackwell resolutely continued submitting applications. She seemed to have won her battle in October 1847, when Geneva Medical College in the town of Geneva, New York accepted her application – the thirtieth she had made. In fact, she was accepted in bizarre circumstances. The medical faculty at Geneva treated her application as a joke. They told the medical students that a woman had applied to become a doctor and she would be accepted if there were no objections. The students believed Blackwell’s application was a practical joke played by a rival college’s students. They played along with the joke and made sure there were no objections. Everyone was shocked when Elizabeth Blackwell actually matriculated at the college. The accepted convention in America at the time was that women did not study medicine. Blackwell began her new life as a medical student, age 26, in November 1847. The college did not accept another female medical student until the 1860s. A very notable event of the year 1848 was the appearance at the medical lectures of a young woman student named Blackwell. “She is a pretty little specimen of the feminine gender,” said the Boston Medical Journal, reporting her age at twenty-six… She comes into the class with great composure, takes off her bonnet and puts it under the seat, exposing a fine phrenology. The effect on the class has been good, and great decorum is observed while she is present. There was some awkwardness about her presence in some lessons – the sensibilities of the time were such that the gentlemen of the college would have preferred her not to hear about some aspects of their work. Blackwell, however, insisted that she should be excluded from nothing, and her wish was granted. After learning some medical theory at college, she returned to Philadelphia for a summer residence in a charity hospital – Blockley Almshouse. Dr. Benedict, the hospital’s chief physician, was very helpful to her, and she gained valuable clinical experience treating and diagnosing patients. Other physicians at Blockley, however, gave her the cold shoulder. She was very glad when the time came to return to Geneva, where her hard work and determination had earned the respect of the lecturers and her fellow students. Her graduating thesis dealt with typhus and emphasized the importance of personal hygiene and sanitation in disease prevention – indeed this was to become one of her lifelong passions. On January 23, 1849, Elizabeth Blackwell, age 28, graduated top of her class, becoming the first woman in America to be awarded a medical degree. Her ambition now was to become a surgeon. Five years later, her sister Emily followed in her footsteps, earning a medical degree at Western Reserve University, Cleveland, Ohio in 1854. After she graduated, Blackwell was aware that she knew too little to practice medicine independently. She needed more experience. A visiting English cousin invited her to return to England with him to broaden her medical experience in Europe, and Blackwell accepted. On June 30, 1849, she enrolled at Paris’s maternity hospital, La Maternité, where she obtained valuable training and hands-on experience in obstetrics. Unfortunately, it was at La Maternité that her hopes of becoming a surgeon were dashed. Pus from a wound on an infant she was treating accidently squirted into her left eye. Her eye became infected and Blackwell went blind in that eye. After a period of recuperation, in 1850 she moved to the UK’s capital, beginning an internship with Dr. James Paget at St Bartholomew’s Hospital in London. She met Florence Nightingale and the two became close friends. Blackwell shared Nightingale’s zeal for personal hygiene and preventative care – something many physicians overlooked at that time, failing even to wash their hands before examining patients. The importance of hygiene in hospitals was often ignored. Poor Ignaz Semmelweis cut death rates dramatically in a maternity hospital in Austria’s capital Vienna by insisting on hand-washing, but his efforts to spread the word were rejected by more influential medical men. Semmelweis became depressed, and in 1865, he was lured into an insane asylum. He was beaten-up by guards and died two weeks after entering the asylum. Age 30, Blackwell returned to New York in 1851. Nobody would employ her as a physician, so she set up her own practice. She also gave public lectures, and her practice began to grow. In 1852, she published a series of her lectures: The Laws of Life with Special Reference to the Physical Education of Girls. In 1853, she established The New York Dispensary for Poor Women and Children. Four years later, she raised enough funds from donors to open a hospital, The New York Infirmary for Indigent Women and Children. Her sister, Emily, and another qualified physician, Marie Zackrzewska helped run the infirmary. The hospital gained a good reputation and also became a center for nurse training. In 1858, Blackwell embarked on a year-long lecture tour of the UK, where she inspired several women to embark on careers in medicine. She became the first woman on the British Medical Register, which allowed her to practice there. She returned to New York in 1859 and continued working at the infirmary. The Civil War broke out in 1861, and Blackwell selected and trained nurses for the Union side, while promoting sanitary care for the wounded soldiers. She hoped to open a medical college for women and to create a chair of hygiene, but the Civil War and its aftermath forced her to put her plans on hold. Finally, in 1868, Blackwell realized her goal and founded a women’s medical college at the New York Infirmary. The college opened with fifteen students and a faculty of nine. Blackwell was Professor of Hygiene. Her sister Emily taught obstetrics and diseases of women. The college selected students using entrance exams and offered a three year graded course, clinical experience, and an independent examining board. Its aim was to provide an ideal education for women training to practice medicine. The college remained open until 1899, when Cornell University Medical School began accepting women students. In 1869, age 48, Blackwell returned to the country of her birth permanently, establishing a large and successful practice in London. Before leaving America, she passed the reins of the New York Medical College and infirmary to Emily. In 1875, she accepted the Chair of Gynecology at the London School of Medicine for Women. Unfortunately, after only a year, her own ill-health (biliary colic) forced her to retire from both lecturing and medical practice. Blackwell was a prolific author on health and social topics and continued writing in her retirement. Her works included Medicine and Morality (1881), Purchase of Women: the Great Economic Blunder (1887), and The Influence of Women in the Profession of Medicine (1890). At the age of 74, in 1895 she published her autobiography, Pioneer Work in Opening the Medical Profession to Women. Blackwell became a naturalized American citizen at the age of 28, in 1849. Although she never married, in 1854 she adopted a seven-year-old Irish immigrant orphan, Katherine Berry – Kitty – who travelled with her and stayed with her all her life. In 1879, Blackwell left London for the town of Hastings, on England’s south coast. Every summer she vacationed in Kilmun, a coastal village on Scotland’s Holy Loch. In 1907, age 86, she fell headfirst down a flight of stairs in Kilmun and was left physically and mentally disabled. 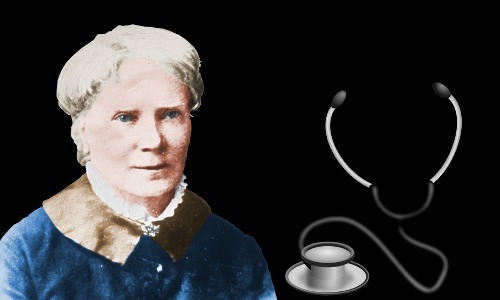 Elizabeth Blackwell died at the age of 89 on May 31, 1910 of a stroke at her home in Hastings. In accordance with her wishes, her ashes were buried in the cemetery at St Munn’s Parish Church in Kilmun. "Elizabeth Blackwell." Famous Scientists. famousscientists.org. 10 Jan. 2017. Web.